Reverend Chilly Chilton and his “Real Church” are probably well-known to you, if you walk the downtown stretch of Caniff Street east of Jos. Campau. They’ve been there for over six years, and their boldly lettered sign is a beacon for the many Hamtramck-area teens, and others, who frequent the building. There’s often plenty of activity going on, and everyone is plenty friendly without being too proselytizing. In the interest of full disclosure, we should mention that we have had a relationship with Real Church over the years, running ads for them, having their kids deliver our city directories, and even letting them park their bus in our yard. That sign out front has just recently changed – from “Real Church” to “Courage Coffee,” featuring a lion motif, a la “The Chronicles of Narnia” – but their essential mission has not, which we verified when we conversed, by “e-pistle,” if you will, with their head dude, the Reverend “Chilly” Chilton. So, Reverend – tell us first, if you would, about the changes to this building, both inside and out. I was, of course, in there recently, and it looks like you guys have done a really nice job of turning the place into a legitimate coffee house. You kind of always had that thing going on, more or less from the beginning, didn’t you? What made you decide to go sort of “whole hog” with the coffeehouse concept? Chilton: Real Church opened its doors to Hamtramck on Oct.10, 2004. And, when we first opened, we designed a coffee café which we simply referred to as Real Cup. It has always been our desire to have a café that was opened to the community on a more regular basis. At the beginning, we knew the timing was not right to open every day, so we just ran the coffee shop before and after our services. Then, as we approached 2012, we sensed the time was right to really do something bigger and better. So, we took the step of faith and rebranded Real Cup to Courage Coffee. 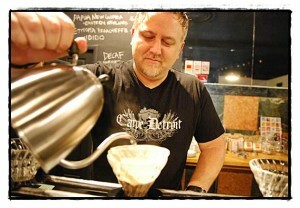 In taking this step, we determined to try to offer the freshest and most unique coffee in the greater Detroit area. We changed our sign out front from Real Church to Courage Coffee, repainted the entire interior of our building, added new floor paint and epoxy, and purchased unique coffee brewing equipment. We have heard nothing but great comments about our coffee, café area and customer service. We are designed to offer coffee that is freshly roasted, and from three to four regions of the world. Currently, we have coffee from Rwanda, Indonesia, Papua New Guinea, Ethiopia, Peru and Costa Rica. Our primary brewing method is the V60 Pourover method – which gives the customer a clean, vibrant and tasteful mug of super-fresh coffee. You can also purchase regularly brewed coffee and French-pressed coffee. We also provide free wifi service, and lots of electric outlets for computers. And our larger space, the Courage Center, is not only the meeting place for Real Church but can also provide space for concerts, large group meetings and other unique gatherings. You have another location as well for Real Church, do you not? Where is that, and what is the difference now between what goes on at the two buildings? Is Courage Coffee now more of a youth hangout, while the other is more of a standard church-type set up, or else how are the two buildings seen as different in their purposes? Chilton: Yes, Real Church in One church with Two campuses. Our Detroit campus meets in the Magic Stick (adults) and Garden Bowl (kids) in the Majestic Theater complex right on Woodward Avenue. Our services there are every Sunday at 10:30 a.m. Then, we meet in Hamtramck in what we’re now calling the Courage Center (Real Church) on Sundays at 3 p.m. and Wednesdays at 7:30 p.m. – kids’ programs and nursery care are provided free at each of these gatherings. Our youth ministry, REPO, has 80+ teens that meet each Friday night in the Courage Center at 7 p.m.
Let me say clearly that yes, we are a church that has many young adults attending, but our focus at both campuses is for people of all ages, and we have ministries geared to every stage of life. The desire is for Courage Coffee to serve the best coffee, and put courage into every person who walks through our door! We would love to become a unique attraction and coffee experience for metro Detroit. Our style, approach and menu are distinctive — our coffees are amazing – and we believe that we could become a catalyst for bringing more people to Hamtown! What, if any, sorts of events do you have planned for Courage Coffee, either regularly scheduled ones or special one-off type things? Do you have a person who actively tries to court people to come in and do their things, whatever those may be? Do you have any restrictions with respect to noise concerns, or can you, for example, book some hard rock act that’s loud? Do these performances always have to talk about religion, or incorporate some of that into their bit? Chilton: Our initial plans are to simply grow our current customer base during our scheduled hours: Tues-Fri, 8-5; Sat. 10-6. But, our longer range plans are to expand into evening hours, and also do unique concerts and events on Saturday and Sunday nights. The Courage Center (adjacent to Courage Coffee) has a state-of-the-art sound system, video projectors, a full stage and seating for 150-200. We’re not just another nightclub or bar – and with that said, we’re not just looking to host any band or event. We will purposely look to those (acts) with positive messages, while also aligning with the heart and mission of Real Church and Courage Coffee. What do you hope do gain from the venture? Do you anticipate opening anything else in the near future, either here or in a different city? If so, what might that be? Chilton: Three things come to mind: (1) We want you to enjoy one of the freshest, most delicious cups of coffee every time you come to Courage Coffee; (2) We want you to feel encouraged by our staff and atmosphere with each visit. “To encourage” is to “put courage into” – that’s our goal! That you leave feeling appreciated and valued! (3) We want to honor God. Christ gave His very best so that we could experience life. We live by the motto: Excellence honors God and reflects His purpose. Regarding your question about future endeavors. … Well, we definitely sense a call to encourage, and bring hope to, greater Detroit. We could see Courage Coffee expand to various locations at some point as our church also grows its influence. Simply, we want to know God, and make Him known to others. Tell us a little about yourself, and your association, and involvement, with Real Church. Did you found it, or help found it? How long have you been a part of things here? What things do you directly run from week-to-week here at Courage Coffee and Real Church? Chilton: Yes, I am the founder and lead pastor of Real Church (both here in Hamtramck, as well as in Detroit). My family and I moved to this area in June of 2004 with eight young adults assisting us. By October of that year, we had opened Real Church in Hamtramck. We then expanded our church to two campuses, by opening our Detroit campus in January 2010. A hallmark of our church is that we are more REAL outside the church walls than we are on the inside. So, we are very involved in EVERY event we can find in our community. We’ve been allies to the parks programs, housing projects, and needs brought to our attention through our mayor, police or fellow citizens. My personal involvement each week is: (1) To be lead pastor at both campuses. I speak on Sunday morning and Sunday afternoon. The message is also podcasted via iTunes, and downloaded by 500+ people each weekend; (2) I am manager of Courage Coffee, and oversee all aspects of its operations. I work the counter 20+ hours each week; (3) I am youth pastor for REPO (the student outreach in Hamtramck) on Friday nights. I oversee this ministry and speak most weeks; (4) I run a post-high school internship program for students interested in ministry. We currently have 14 students from five different states. Note: I could not do any of these things without the amazing volunteers that serve our church and community. I do not have any paid staff or assistance. We are a missions-supported, non-profit, outreach to metro Detroit. We have people who have specifically moved to Detroit, Hamtramck and other communities and then found employment, all so that they can be involved in our outreach ministries. How cool is that? Lastly, would you say this (the coffeehouse) has helped attract more young people to your church? Guessing that the answer will be yes, what sorts of activities do they get involved in? Chilton: I think what makes us so appealing to youth and young adults is that we value them, and give them areas to lead and serve. We revel in the laughter of children, and see beyond rough exteriors to the amazing hearts of teens. And, our church in many areas is led by young adults. We respect them, and give them an environment to grow socially, spiritually and mentally. Yes, we have a lot of young people, but we also have a lot of “young-at-heart” people. Listen, if you have a pulse, then you have a purpose. We want to help you discover what that is, and watch you experience the joy of serving others and experiencing God. Feel free to talk about anything else briefly that I didn’t cover. Chilton: God’s love can be experienced in all kinds of forms: outreaches, church services, community clean-up projects, ministering to the homeless, mentoring kids, concerts and, yes, even in a cup of coffee! The Bible says, “Be strong & courageous” – we’re doing this in church, community and coffee. Courage Coffee is located at 2950 Caniff, on the south side of the street, more or less across from the Hamtramck Post Office. Their phone number is (313) 875-7325. Visit their website: http://CourageCoffee.com, and follow them on twitter: @CourageBrewBar. Great article and great coffee!